An eight-hour train, an hourlong bus ride and a 30-minute taxi later, I finally arrive at the Northwestern tip of Vietnam—nearly touching the border of China. Here lays a multitude of hill tribes that stretch among the boundless rice terraced fields of Sa Pa.
Sue Tan, a woman of the Black H’mong Tribe, greets me at the doorstep of her home in Ta Van Mong village with a golden tooth shining in my face. She appears exactly as she did on her Facebook—where of all places I originally connected with her as a homestay and trekking guide. It is barely 40 degrees Fahrenheit in Sa Pa and the rain won’t let up. I enter her home—walls lined with patterned, traditional dress to which I later find out Sue Tan weaved herself. Her daughter hurries over to me and burns a coal fire at my feet inside the living room. She places a Coca-Cola can be filled with water inside the fire to “humidify” the smoky ashes of the fire. Burning aluminum inside this living room cannot be good for my lungs. Also, I took a plane, train, bus, and car to get to this location—how do they have abundant amounts of Coca-Cola here? Sue Tan signals to get ready for our trek as soon as the storm passes. As we head out and round the corner, four other tribeswomen begin walking alongside me with their baskets resting on their backs. When I ask where they’re headed, they just point out beyond the hills. Little did I know they were about to embark on an eight-mile trek with me in the hopes that I would buy one of their handwoven bags or scarves afterward. We march on to what appears to the eye as infinite staircases to the heavens or a coliseum to the gods. When I started inquiring about the agriculture style of rice terrace farming, I became aware of the level of sustainability of this method. The terraces act as dams by holding rainwater, which flows into the rivers at a mild place and, as a result, without any flooding. Simultaneously, the terraces function as filters that purify the water. Why were we able to be more sustainable as a society hundreds of years ago with no thought of climate change, but unable to implement this kind of thinking today with an imminent threat. These indigenous people seem to have something figured out that we don’t. It struck me somewhere along this six-hour journey that I hadn’t seen many men. I asked Sue Tan about this and she gave some insight in return that Hollywood, Washington, and Silicon Valley should all hunker down and listen to: essentially, women are the breadwinners around here. They are trekking, weaving and selling all day long. The men are stay-at-home fathers and care for the land when their children are in school. Yet, for how progressive—or even radical—this way of thinking is by today’s standards, so much of the hill tribe culture is rooted in the past: children are married by age 16 or 17 and have children of their own by the time they are 18. If you are pregnant before you are married, like Sue Tan’s daughter, you must quickly arrange a wedding or you will be ostracized from the community. While marriages are arranged, bachelors have the quick chance of finding a counterpart on their own at a formal dance event—pending their parent’s blessing. The pickup moves from when Sue Tan was young are being wiped out by today’s technology. In the past, a boy would flirt with a girl by playing her a tune on a plant. Yes, a plant. I like to think of it as plant-based Tinder. But today, children have access to phones, so, unfortunately, social media is eradicating some of these unique customs. So much has changed from when Sue Tan was her daughter’s age. Ten years ago, there was no education system in Sa Pa. Every lick of English that she speaks is based on a few years of listening to tourists. Not only has she had no formal schooling, meaning no training in English or Vietnamese language, but also her people have no written language. So, it is quite impressive that Sue Tan is able to connect with clientele via Facebook, TripAdvisor, and Airbnb. Meanwhile, I can’t even get my westernized-tech company-consulting-mother to master copy and paste. Sue Tan has an entrepreneurial gene native in her DNA that is unmatched. Over a bowl of phở, she described an idea she has to open a museum with the money she is making from her homestay and trekking business. 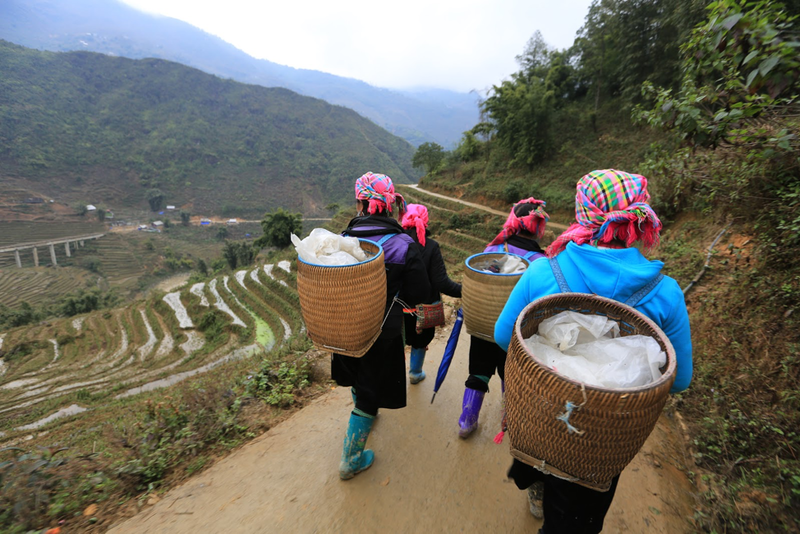 Sa Pa is undergoing a bit of a tradition cleanse, especially among the younger generation—in part thanks to formal schooling and new technologies available. As a result, Sue Tan wants to employ local village women to continue making and teaching traditional weaving techniques. The dress they design, in addition to the dress that has been passed down for generations in Tan’s family, will be hung up on display. The museum will be a public space for tourists and locals alike—a place where they can not only commemorate these customs, but also a place where two distinct groups of people can come together. It is essential when traveling to Sa Pa to uphold this idea of unity and immersion. As the city of Sa Pa expands with restaurants and hotels under slabs of cement, more and more of these hill tribes are being affected. Living with one of these families is not only eco-friendly, but also the most authentic way to get a glimpse into the world of a people not so different from our own. is a Journalism major and Cinematic Arts minor at the University of Southern California. During the spring semester of her junior year she studied abroad in Auckland, New Zealand.